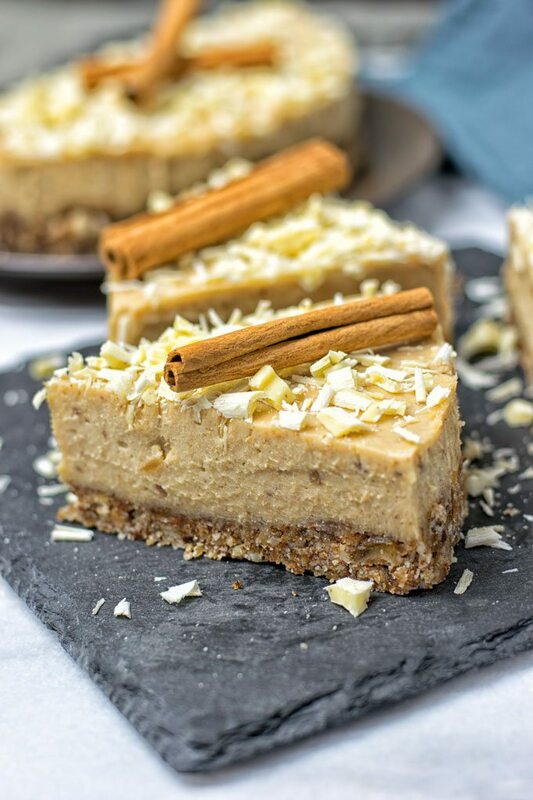 My Cinnamon White Chocolate Cheesecake is a vegan and gluten free no-bake cake. Make this stunner from just 6 ingredients in 2 easy steps. It’s dessert time again. Although I guess there is always time for something sweet. I’ve been working hard on Cheesecake Recipes recently. 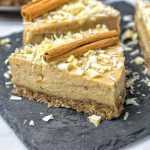 If you haven’t yet checked out my Lemon Cheesecake Mousse, the Pumpkin White Chocolate Cheesecake, or my Raw Vegan Peanut Butter Cheesecake, it’s high time you do so now. 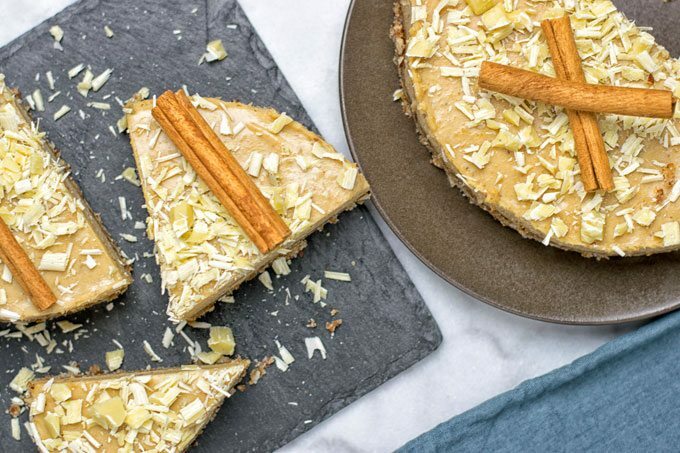 And then you are ready and well prepared to enjoy the newest addition to this eclectic list: the Cinnamon White Chocolate Cheesecake. I have to admit right away that this has become by far my favorite cheesecake. It’s somewhat strange that I’m on such a cheesecake roll. I was never that much of a dessert or cake fan. That is making desserts or cakes – eating is a totally different matter. But nowadays I really, really enjoy the sweet creativity immensely. And this dream cheesecake will happen now. I hope you’re all in line for my Cinnamon White Chocolate Cheesecake. It’s a stunner, beautiful, perfectly flavored thanks to cinnamon and dates. Creamy thanks to coconut milk and cashews. Chocolaty from the vegan white chocolate: drool worthy, easy, addictive. I promise you will have a hard time controlling yourself not to eat the whole cake. Preparation is an easy game as always. In only 2 easy steps and from just 6 ingredients! Excited? Ok, let me show you how we can make this cheesecake dream reality. First hop over to a blender or food processor and combine almonds, Medjool dates, and cinnamon. Process until you have a crumble texture. Do not over-process or it will end up too smooth. Just a crumbly texture is ideal. Press this dough mixture into a 7 inch springform that you have prepared with parchment paper or greased a little with just a bit of coconut oil. Next comes filling and we need another round of blending. Combine cashews, cinnamon, coconut milk, Medjool dates, and optional organic vanilla powder. Process this time until really smooth. While the blender is running, melt the vegan white chocolate in a microwave or just on the stove in a water bath. Fold the melted chocolate into the filling. Give the filling onto the dough and finishing with more chocolate sprinkles. Chill and enjoy. Just a heads up if you’re using the optional vanilla powder: please make sure it’s organic. Many vanilla powders and extracts may contain a lot of preservatives. Benefits: zero for you and your body. 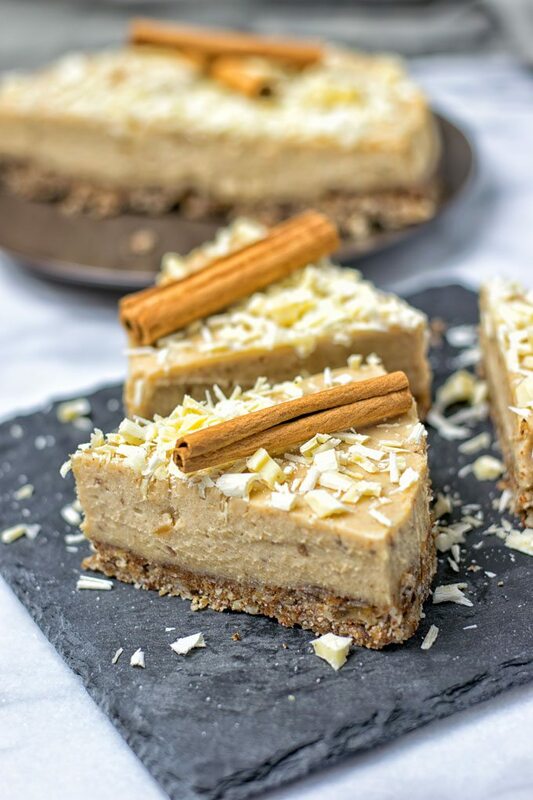 So whenever I use vanilla in my recipes I always use organic, but in this Cinnamon White Chocolate Cheesecake it’s totally optional. The Vanilla Powder enhances the cinnamon flavor so well, but if you can’t find any organic vanilla powder, just leave it out. The cheesecake is absolutely delicious without the vanilla powder too. 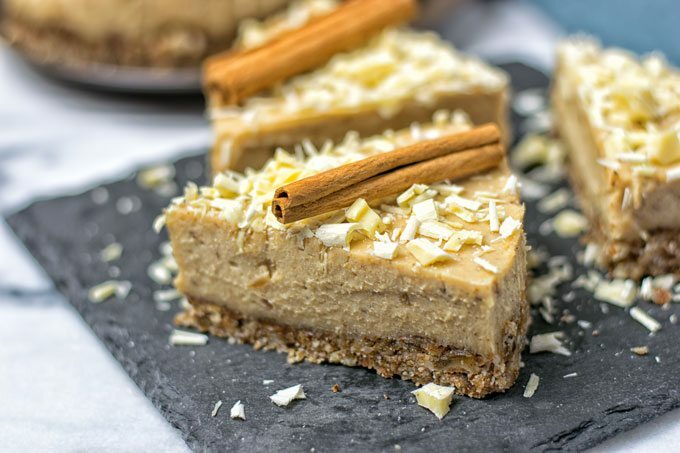 Cinnamon is one of the main flavor carriers of this cheesecake. The powerful spice just blend together perfectly with the white chocolate and the cashews. But that is not all. Cinnamon has been used as medicine for a long time and is still known for its health benefits. It’s anti-inflammatory, and an anti-oxidant. Gives you a immune system boost, and so much more. Read fully up on the whole background in this article “Health Benefits of Cinnamon & Nutrition Facts“. 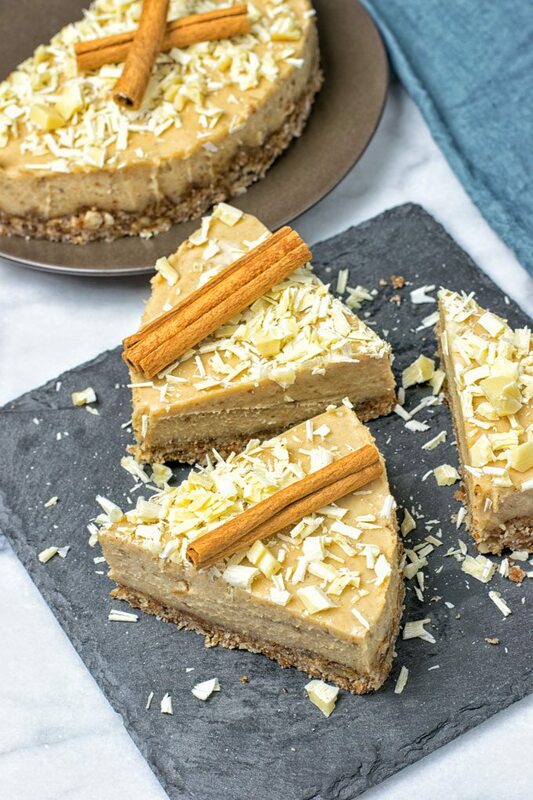 Friends, if you make this Cinnamon White Chocolate Cheesecake, I can’t wait to see all your amazing creations. Tag me on Facebook or Instagram as always. Use a blender or food processor and combine almonds, Medjool dates, and cinnamon. Process until you have a crumble texture. Do not over-process or it will end up too smooth. Just a crumbly texture is ideal. Press this dough mixture into a 7 inch springform that you have prepared with parchment paper or greased a little with just a bit of coconut oil. Combine cashews, cinnamon, coconut milk, Medjool dates, and optional organic vanilla powder again in the blender or food processor. Process this time until really smooth. While the blender is running, melt the vegan white chocolate in a microwave or just on the stove with water. fold the melted chocolate into the filling. Give the filling onto the dough and finishing with more chocolate sprinkles. Chill and enjoy. That is brilliant! And beautiful! And has me craving it! Omg, Florian! 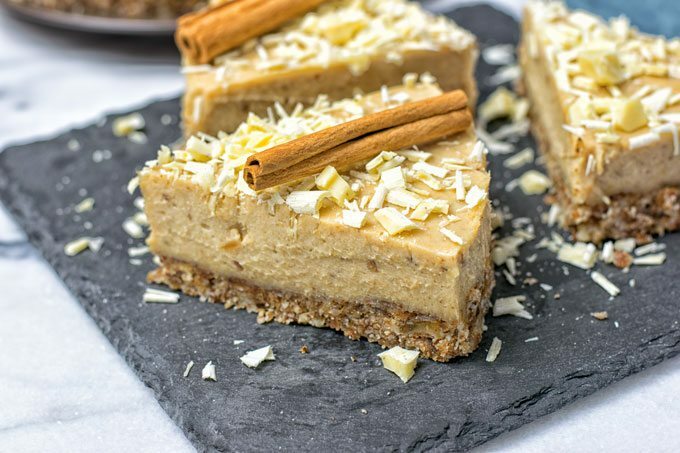 You just combined two of my very favorite things…cinnamon and white chocolate! Oh my! Cinnamon, well, I think you know if my favorite flavor ever, hahahah…and adding white chocolate is just an amazing idea. The texture looks so delicious, creamy and perfect and the photos, well, I’m drooling. I love that you used all natural ingredients too, all stuff I already have in my home! Thanks so much for the compliment on my pictures means a lot to me, Brandi! What type of coconut milk? I used canned full fat coconut milk! For the cashews should they be raw and if so should you soak them? Hi Karen! Cashews should be raw! Soaking will depend on your blender. A strong high speed blender won’t need it. But a regular blender will definitely need it! I made this cinnamon & white chocolate cheesecake for Christmas. It was a hit,the entire family enjoyed it. Hi Leigh! Thanks so much for your amazing feedback! Glad it was such a big hit with your family! I hope you’ll find lots of more recipes to try! If you enjoy this recipe so much, would you mind to give it a rating?